This is such a beautiful accompaniment to any summery meal. It keeps well in the fridge so it’s also a great option for those of you who love a good meal prep. Serve it along side any salad, as part of a Buddha bowl or however you like. Feel free to add additional or different vegetables to make this dish your own. Cook the quinoa with the veg stock as per instructed on the packet. In a frying pan, sauté the spring onions and peppers in 1 tbsp of garlic infused olive oil, over a medium heat until softened. Add the cooked quinoa to the pan, along with the lemon juice and herbs. Give everything a good stir so it’s all combined and fluffy. Take off the heat, taste and adjust seasoning if necessary. 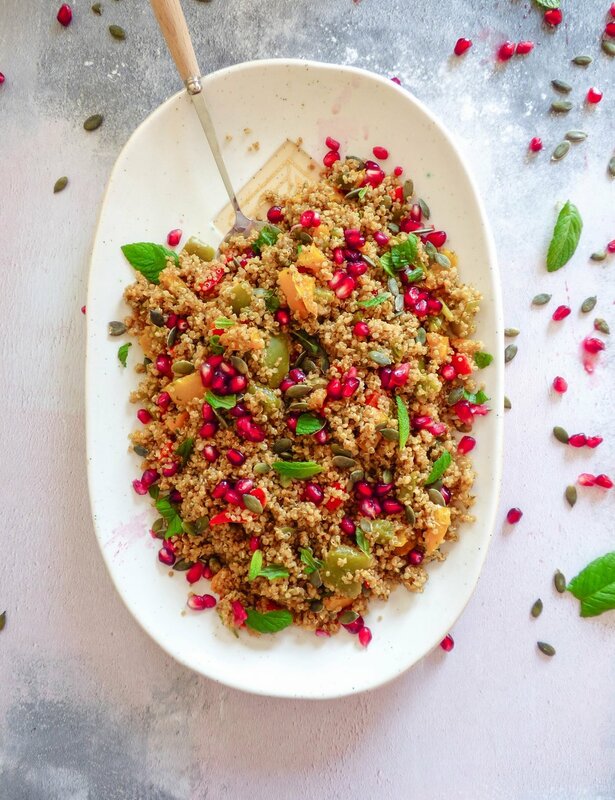 Stir through the pumpkin seeds and pomegranate, scatter over the mint leaves, serve and enjoy. Store any left overs in an airtight container in the fridge for up to 4 days.